A true 24-hour snapshot of my living with a dust mite allergy that causes eczema reactions. Incidents occurred one week ago. Two and a half weeks ago, I started immunotherapy with the cluster allergy shot method to address my dust mite and grasses allergies. I go to the allergist twice a week and get three separate injections of each allergen, dust mites on the left arm and grasses on the right arm. After each dose, I wait 30 minutes to ensure I don't have a reaction. 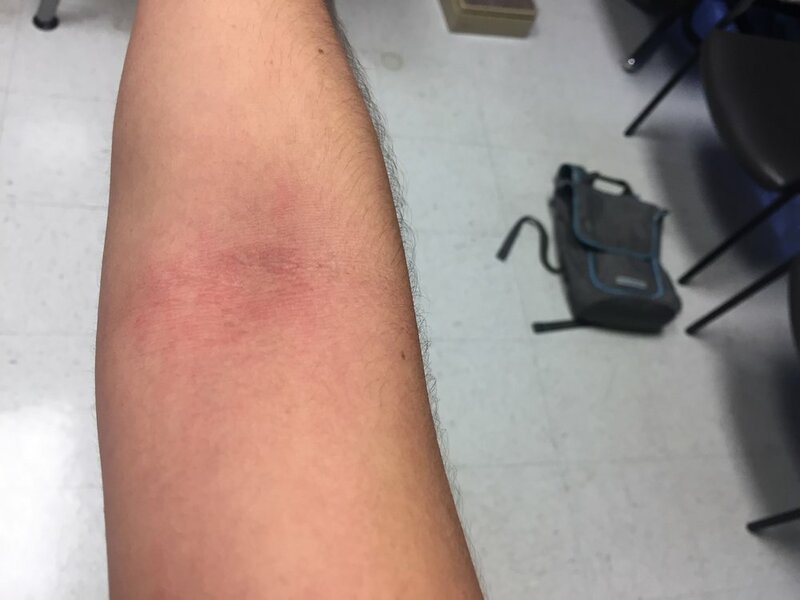 My grasses-injected arm has felt and looked unaffected, with only a little bit of dryness in the area. My dust-mite-injected arm, however, has been swollen, itchy and painful. It aches to the point where I can't sleep well. I have the typical lifestyle of someone with a serious dust mite allergy: blinds instead of curtains, wooden floors, no rugs, leather furniture, difficulty wearing winter clothes, encased mattresses and pillows, etc. However, there's one throw pillow I have on my leather couch that I've not addressed: I need to replace it with an encased throw pillow. I caved and used this unsafe pillow for a few hours while I worked on the couch. My eyes started watering and an eczema reaction occurred on one of my eye lids. Thankfully, the reaction was contained, didn't spread, and went away within an hour after getting off the pillow and adding Protopic cream. I received my first set of injections, waited 30 minutes, got my second set of injections, waited 30 minutes ... then, suddenly, right before I was to get my third set of shots, I realized my neck was a little itchy. I looked in the mirror and saw a serious eczema flareup getting worse by the second. It started to spread onto my right inner elbow and possibly my legs (felt itchy, but was wearing pants, so couldn't confirm). My allergist and nurse quickly gave me a low-dose adrenaline shot. Low dose?! Within minutes, my hands were shaking and my heart was racing. I don't consume caffeine, so my body really felt the adrenaline. According to my allergist, my adrenaline shot was comparable to a low-dose EpiPen shot. I've never used my EpiPen, but now know how it would feel. Honestly, I never considered using an EpiPen for an eczema reaction, no matter how severe, but my allergist says a reaction on my skin can shift to my throat (i.e., impede my breathing) quickly. Point taken. Success! My eczema reaction to my dust mite allergy shots went away within a few hours. I am very lucky that my eczema is in a contained state with my current treatment (Dupixent, Protopic and Vitamin D supplements). I've never experienced such a quick and severe eczema reaction only to see it disappear within the same day. Key takeaway: My dust mite allergy is legit!